We want to make sure your Madison meeting is a success! This section of our planner tool kit focuses on frequently asked questions and tips for working with other organizations in Greater Madison, from city and state officials to community calendars. If you have any additional questions, please consult with our Convention Services Team. To request a proclamation or welcome letter from Wisconsin Governor Tony Evers, click here. Please note that the Governor&apos;s office requires a one-month lead time for these items. To request a letter signed by a Madison city official, simply e-mail our Convention Services Team your request with the name, date and type of meeting event. Note: please allow a minimum of three weeks to receive your personalized letter. 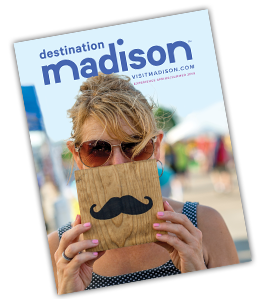 Ask Destination Madison to assist at your event! We can provide registration services or visitor information to help make the most of each attendees visit. Email our Convention Services Team for pricing and availability. Note: This service is provided at a minimum of four hours at each event. You must reserve this service at least three weeks in advance of your event. Cancellations made less than seven days in advance of your event will be charged a fee. Help us help the local community by donating excess food or products from your event to agencies including senior centers, homeless shelters and after school programs. Contact our Convention Services Team for details. Or, give back by going green when you review Wisconsin&apos;s special event recycling guidelines. Connect to important people and places in our capitol city with this handy list of links. View details on adding this ceremonial service to your opening or closing events. Make sure you&apos;re set to bring your event to the streets and sites of the greater Madison area! Learn more about City of Madison and Dane County parks, parade permits, and use of the State Capitol facilities. Connect with Department of Revenue reporting requirements that need to be submitted when you hold a temporary event such as a carnival, craft fair or other fundraising event. Download details on local listings for Saturday, Sunday and other services in the area. Download details that will help keep attendees safe and sound in case of emergency.